Video, email, lead capture, surveys and more. "The typical Voodoo client earns over 17 times their investment back within a year." Is it really this easy to automate repetitive communications and stop opportunities from falling through the cracks? Yes. Voodoo makes it happen...automagically. It starts with Ease of Use and the power of Video. 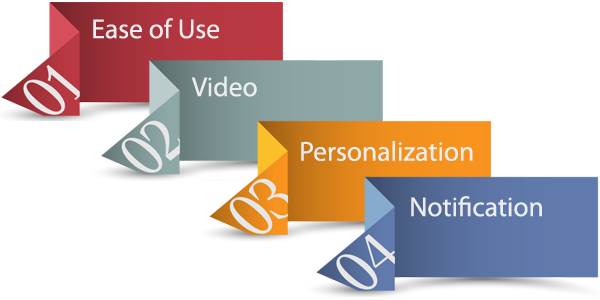 Nothing matches video to convey information and make it “sticky” (memorable). Simply put, Video is a vital key to your future success. Another key is Personalization. We can't find any other system that allows automatic personalization of everything—sender and recipient identity, email content, video frames and more. It all works together to maximize response, customer satisfaction and referrals. And Notification. Wouldn't it be awesome if the right people on your staff could know whenever something important happens? With Voodoo, they will...every time, in real-time. Let's not forget Infinite Control. We give marketing leadership control of the big picture, while each user can be given control of exactly what they need to be most efficient and effective. Send centralized campaigns “on behalf of” one or more reps, or send campaigns directly from the reps themselves...or both. It's always your choice. Plus, the platform is so Affordable that using pieces of Voodoo to enhance and automate your existing systems can generate sales or savings worth many times its cost. Even if a user doesn’t require the whole platform (for example, if they are using another CRM system), they can leverage vital features like dynamically personalized videos, capture forms, smart surveys, etc. The simple cloud-based campaign launcher. Send pre-built campaigns with no learning curve. Ideal for sales reps and channel partners. “Lite” eVideo Launcher and Voodoo Video Club accounts stand alone or piggyback on the content in your company's Business Builder system. Make your video, email and other content available for instant broadcast by reps and partners, generating major cumulative sales impact. Low-cost, easy-to-use accounts—Low monthly per-seat cost makes Voodoo affordable to channel partners and individual reps.
An effective Channel Partner “on-boarding” tool—This simple system is proven to help newly signed partners start selling your products more quickly and effectively. Users can upgrade to full-featured Voodoo Business Builder at any time. Telecom resellers and sales reps can join the Voodoo Video Club for Telecom Sales to get over $150,000 worth of exclusive prospecting videos for voice, data and networking, custom-branded for your company. Click here to learn more. Check out Voodoo's new Video Brandcaster here. Instantly brand YouTube videos for social sharing and rapid growth.